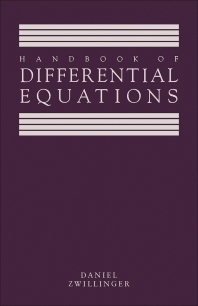 Handbook of Differential Equations is a handy reference to many popular techniques for solving and approximating differential equations, including exact analytical methods, approximate analytical methods, and numerical methods. Topics covered range from transformations and constant coefficient linear equations to finite and infinite intervals, along with conformal mappings and the perturbation method. Comprised of 180 chapters, this book begins with an introduction to transformations as well as general ideas about differential equations and how they are solved, together with the techniques needed to determine if a partial differential equation is well-posed or what the "natural" boundary conditions are. Subsequent sections focus on exact and approximate analytical solution techniques for differential equations, along with numerical methods for ordinary and partial differential equations. This monograph is intended for students taking courses in differential equations at either the undergraduate or graduate level, and should also be useful for practicing engineers or scientists who solve differential equations on an occasional basis.